Mahseer are the most popular game fish amongst anglers in India, with a reputation as one of the toughest fighters amongst freshwater sports fish. In this article, we have made an attempt to compile information on recreational mahseer fisheries in India. 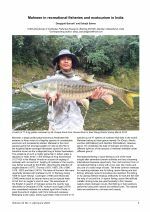 The importance of the mighty mahseer as a game fish is told through the perspectives of active anglers and the visions of stakeholders and researchers in conservation and ecotourism are presented. Jharkhand, India, has a significant population of tribal people, around 28% of the state's 33 million. Agriculture is the main livelihood and subsistence-level farming is predominant, offering limited opportunities for employment to landless people for most of the year. 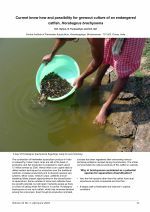 This article documents the experience of the Jharkhand Department of Fisheries in developing cage-based aquaculture as an alternative livelihood for tribal fishers that had been displaced by the construction of reservoirs, working in association with fisher collectives. 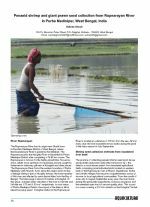 Some varieties of freshwater fish have low growth potential but remain economically attractive due to market preferences. The endangered catfish Horabagrus brachysoma is one such fish, which has limited production but high market demand, and a number of favourable biological characteristics. 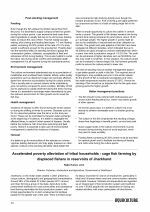 This article provides guidelines for the culture of this catfish in captivity including for the breeding, nursery, stocking and growout, including advice on pre- and post-stocking practices, harvesting and health management. 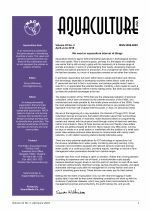 We are at the beginning of a new revolution, the Internet of Things (IOT): Smart networked devices and sensors that collect information about their surroundings, communicate with people and machines, make decisions based on programming models and interact with the physical world through control of switches, motors and actuators. Many of these devices are low-cost, literally a few dollars and they are getting cheaper all the time. The IOT offers new opportunities for the aquaculture industry to improve on-farm efficiency. 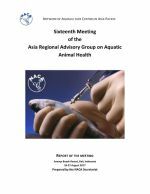 This report summarises the proceedings of the 16th meeting of the Advisory Group, held 26-27 August 2017 in Bali, Indonesia. The group's role includes reviewing disease trends and emerging threats in the region, identifying developments in global aquatic disease issues and standards, evaluating the Quarterly Aquatic Animal Disease Reporting Programme and providing guidance on regional strategies to improve aquatic animal health management. The meeting included discussion on Tilapia Lake Virus (TiLV) and developments in antimicrobial resistance. The American Fisheries Society and the Environmental and Water Resources Institute of the American Society of Civil Engineers are holding this year's annual Fish Passage conference in Australia in December in collaboration with hosts Charles Sturt University and the New South Wales Government. The International Conference on River Connectivity, to be held in Albury from December 10 to 14 includes the First International Symposium on Hydropower and Fish Management. Despite their abundance at one time in India and other Asian nations, wild mahseer populations have been declining because of degradation of aquatic ecosystems, urbanisation and indiscriminate fishing. Wild mahseer are populations are presently struggling for their mere existence. 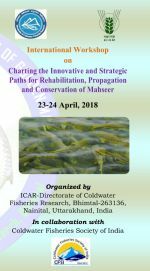 An international workshop on mahseer conservation, propagation and rehabilitation will be held in Bhimtal, India from 23-24 April 2018. The workshop is organised by the ICAR-Directorate of Coldwater Fisheries Research in collaboration with the Coldwater Fisheries Society of India. 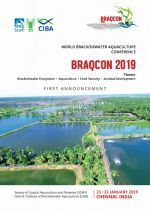 BRAQCON 2019 wil cover latest research and development in the broader themes of the conference in the form of special sessions, contributed papers, expert group discussions and brainstorming on issues facing aquaculturists and ecosystem managers in India and around the world. 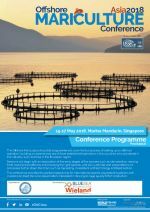 The conference themes include: Brackishwater ecosystems, estuarine biodiversity and conservation; aquaculture production systems; larviculture; fish and shellfish nutrition; environment and climate change; aquatic animal health; socio-economic and livelihood issues; and aquaculture genetics and biotechnology. Offshore Mariculture Asia 2018 will cover the full process of setting up an offshore operation, building on experiences learnt from established operations in the countries who pioneered in this industry. Sessions will begin with an exploration of the early stages of the process such as site selection, moving from nearshore to offshore and choosing the right species, and will culminate with presentations on processes further down the chain such as marketing, investment and technology and feed section.